We believe that global health security is everyone’s responsibility. The fight against the growing threat of pandemics requires coordinated effort from governments, civil society and healthcare companies. Johnson & Johnson is committed to doing our part to prevent and prepare for the next pandemic, so that the international community and health systems are better prepared. Our Infectious Diseases & Vaccines Therapeutic Area work plays a critical role in that effort. As part of this commitment, we have become an active participant in many recently formed coalitions focused on pandemic preparedness. 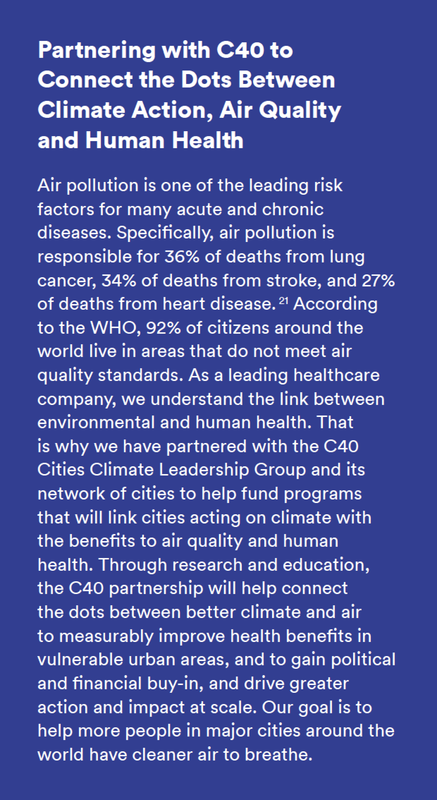 For example, with a goal of stopping epidemics before they strike, in 2017 we joined forces as a founding member with the World Economic Forum, the Bill & Melinda Gates Foundation, the Wellcome Trust, the governments of Norway and Germany and other organizations to form a unique public-private partnership, the Coalition for Epidemic Preparedness (CEPI). CEPI’s mandate is to fast-track development of life-saving vaccines targeting priority pathogens and support epidemic preparedness within high-risk countries. CEPI achieves this by providing better financial incentives to encourage or offset the cost of development for vaccines so we are better prepared for future potential outbreaks. In 2017, the Company also supported a digital series called "From Healthy to Secure" that was launched in partnership with Devex and PATH, and which explores what the term "global health security" really means; asks how disease can impact security; and looks at how stakeholders across sectors of society are striving to keep the world safe. 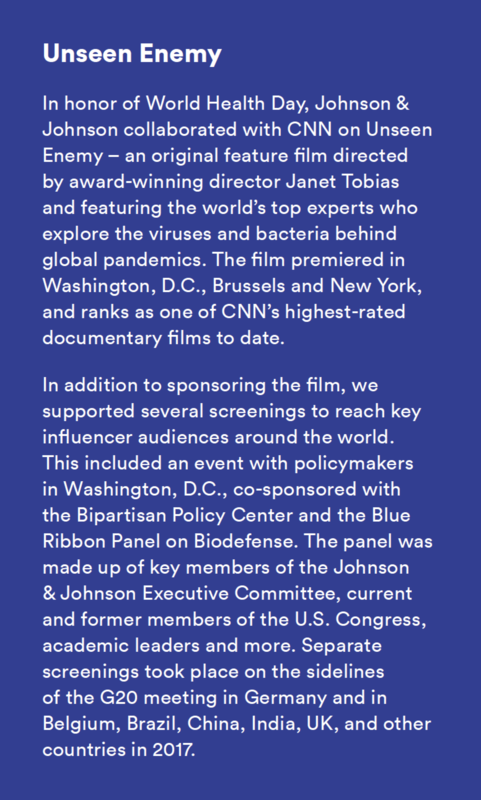 In light of our support of pandemic preparedness, as seen in Unseen Enemy and championed around the G20 meeting, our goal was to explore the intersection of global health and security. The series focuses on the importance of supporting strong, resilient health systems; funding R&D; establishing surveillance; ensuring access to care; and highlighting the critical role of the private sector in those efforts. 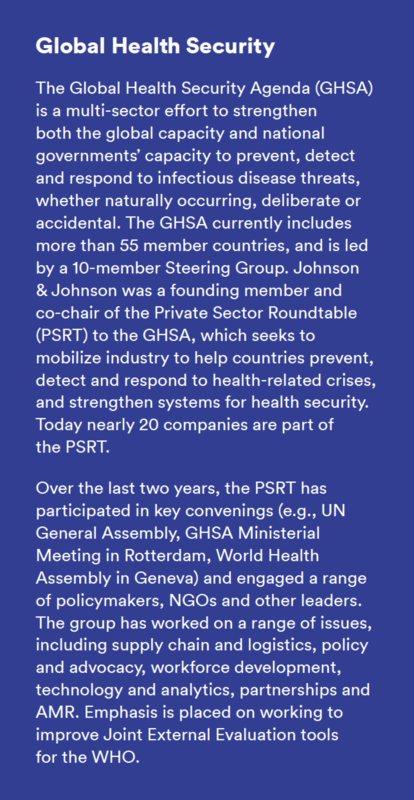 AMR is a complex issue driven by unique public health, environmental, and economic factors and requiring a multi-faceted and coordinated response from stakeholders, including healthcare authorities, pharmaceutical companies and the public. Solving for any one issue in isolation will not address the breadth of this challenge. Rather, a comprehensive approach is needed, with shared responsibility and accountability across partners. 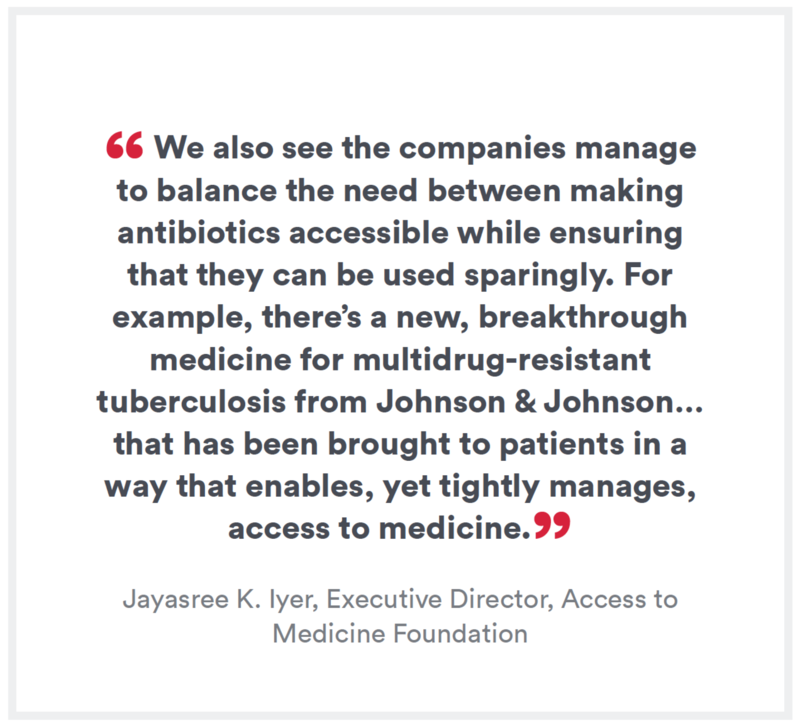 At Johnson & Johnson, we recognize our responsibility to help address AMR, and we welcome and support the ongoing regional and international dialogue on AMR. As one of the original signatories of the Davos Declaration, in 2016 we joined the industry-wide call to curb development of AMR, also endorsing the Roadmap on Progress for Combating AMR in the same year. Supporting work on ensuring antibiotics are being used only in patients who need them: We have several programs that help advance antimicrobial stewardship. Our education efforts for healthcare professionals cover a range of topics, including appropriate use, diagnosis, pharmacovigilance, and adverse event reporting/monitoring of regimen side effects. For example, through unrestricted educational grants, we have engaged the International Union against TB and Lung Disease since 2014 to impart medical education programs on MDR-TB in Peru and South Africa (with attendees from neighboring countries). We also worked with USAID to support training on the implementation of a Pharmacovigilance Program for TB Drugs for staff from National TB Programs, and for national health authorities in China, India, Indonesia, Myanmar, Pakistan, Papua New Guinea, Philippines, Thailand and Vietnam. Improving access to existing and future antibiotics and other tools: To expand access to our antimicrobial medicines and other related products, we use a wide variety of approaches, appropriate to the specific reimbursement systems and legal guidelines of different countries. Using mechanisms such as tiered pricing, partnerships with public health organizations, and donation programs, we strive to engage stakeholders to help achieve broad and timely access to our medicines in a way that is affordable locally. Examples of our initiatives are the program to broaden access to MDR-TB therapy with SIRTURO (bedaquiline) and the HIV therapy access program. One of the major drivers of AMR-related infections in the United States and Europe is hospital-acquired infections. Across our Medical Devices segment, we seek to prevent these infections through a variety of antimicrobial and sterilization technologies, including antibiotic-containing bone cements, antimicrobial sutures, chlorhexidine protective disks and more. For more on our approach to access and pricing broadly, please see the Affordability and Access Initiatives sections. Reducing the environmental impact from the production of antibiotics: in 2017, we conducted a comprehensive review of the manufacturing practices in our own sites and those of key external manufacturers to identify best practices in controlling releases of antibiotics into the environment; we worked also with experts to establish science-driven, risk-based targets for discharge concentrations. For more information, see Pharmaceuticals and Personal Care Products in the Environment section. Supporting new ways for open collaboration between industry and the public sector: We collaborate with a range of stakeholders and institutions to advance AMR research. In 2017, we announced partnership with the Institute of Microbial Technology (IMTECH) in India to unlock the potential of Indian science and help accelerate the discovery of innovative new treatments for TB. We also signed a Memorandum of Understanding with the Indian Council for Medical Research to bolster clinical trial capacity (in particular for Phase 1 studies) in India. This capacity building is designed to support faster development and approval of TB medicines for India, in India. For more information, see Tuberculosis. From a policy perspective, we recognize that there is no one-size-fits-all approach to addressing AMR. We welcome and support legislative changes that will streamline regulatory pathways. Additionally, we believe new incentive mechanisms are needed to remove economic barriers to support investment in AMR, such as orphan or breakthrough designations and continued use of priority review vouchers. For more information on our commitments to and positions on AMR, see Antimicrobial Resistance Policy Statement. Because of ease of transmission and rapid mutations, influenza viruses continue to pose a significant threat to global public health. Every year, more than one billion flu cases are reported worldwide, resulting in five million cases of severe illness and between 291,000 and 646,000 deaths globally.17 Addressing this threat is one of the focus areas for Janssen. Our ongoing collaboration with the U.S. Health and Human Services’ Office of the Assistant Secretary for Preparedness and Response has led to a Janssen/Biomedical Advanced Research & Development Authority (BARDA) partnership focused on developing a portfolio of therapeutics and vaccines to protect communities from influenza outbreaks. A research team led by the U.S. Centers for Disease Control and Prevention (CDC) has estimated the global death toll from the 2009 H1N1 influenza pandemic at more than 284,000 – about 15 times the number of laboratory-confirmed cases.18 This presents a worldwide challenge requiring a unified response from both the private and public sectors. This new collaboration brings together the scientific capabilities of Janssen with BARDA’s world-class expertise to accelerate development of effective countermeasures. Influenza therapeutics with new targets and mechanisms of action are urgently needed to combat potential new pandemics, emerging viruses, and antiviral drug resistance. Further, the flu can mutate—known as “antigenic drift”—from season to season, making it hard to predict which strains will strike. Janssen R&D and a team of researchers from The Scripps Research Institute published research in September 2017 about devised artificial peptide molecules that neutralize a broad range of influenza virus strains. Peptides are short chains of amino acids – like proteins but with smaller, simpler structures. This research reflects Janssen’s commitment to develop new approaches. The Company is also exploring new ways to address antigenic drift while collaborating with partners on the development of an investigational single universal vaccine to help protect against influenza. In another step forward in our work on influenza preparedness and treatment strategies, Janssen announced the U.S. FDA 510(k) clearance for the IDYLLA Respiratory Panel (IFVRSV), a diagnostic test that can help doctors accurately identify viral infection types in their patients, and thereby develop more precise and personalized treatment options. IFVRSV can detect two of the most common human respiratory viral infections—influenza and Respiratory Syncytial Virus (RSV)—as well as other types. Severe influenza impacts five million people worldwide each year, with children and the elderly the most vulnerable.19 We are hopeful that better detection tools, such as IFVRSV, can make an immediate and dramatic difference in the detection and treatment of influenza worldwide. The 2014 – 2016 Ebola outbreak in West Africa, the largest since the virus was discovered, struck thousands of people, with reported cases stretching from West Africa to Europe and the United States. The speed and severity of this outbreak was unprecedented. In response, the world’s scientific, pharmaceutical, regulatory and public health communities united to stop the pandemic. Johnson & Johnson was at the front lines, launching a series of partnerships with leading research institutions across the globe to help accelerate clinical testing of an Ebola heterologous prime-boost vaccine regimen (the sequential administration of vaccines that use different antigen-delivery systems) in development at Janssen. Johnson & Johnson remains fully committed to this vaccine development program, so the world can be better prepared when another outbreak occurs. We have partnered with the WHO and The National Institute of Allergy and Infectious Diseases (NIAID), part of the National Institutes of Health (NIH), and other stakeholders on the clinical testing, development, production and distribution of the vaccine. This has led to fast-tracked development and deployment of a prime-boost vaccine regimen through multiple Phase 1 and 2 studies in rapid succession across Africa, Europe and the United States. The vaccine regimen, which was discovered in a collaborative research program with the NIH,20 includes a prime-boost combination of two components that are based on AdVac technology from Janssen and MVA-BN technology from Bavarian Nordic, a biotechnology company based in Denmark. Additionally, we have scaled up production of vaccine regimens and received support from global, national and local authorities. A total of 11 Janssen-sponsored Phase 1, 2 and 3 clinical studies of the Ebola vaccine regimen are being conducted across Africa, Europe and the United States. Final clinical data from a Phase 1 study conducted in the UK were published in March 2017 in The Journal of the American Medical Association. In this study, 100% of healthy volunteers receiving the vaccine regimen generated an Ebola virus-specific antibody response that was sustained to at least one year following vaccination. We received a new grant award from BARDA, part of the U.S. Department of Health and Human Services, to advance our investigational Ebola vaccine regimen. Funding from BARDA totaling $44.7 million over five years will help support the development and potential licensure of the prime-boost Ebola vaccine regimen. The funding represents one of the first of BARDA’s Project BioShield awards for investigational Ebola vaccines and drugs. To determine which Ebola vaccines are the most effective and safest, clinical trials have been initiated by the international Partnership for Research on Ebola VACcination, and will include evaluation of Janssen’s as well as competitor candidate vaccines. The ultimate hope is that these trials will determine which vaccines could best prevent—or quickly control—future outbreaks and potentially save lives. The unprecedented Zika virus epidemic across the Americas in 2016 led the WHO to declare Zika a public health emergency of international concern. In response to the outbreak, Johnson & Johnson enacted a plan that worked on three fronts: helping pregnant women and babies; supporting the Brazilian government’s work to prevent Zika; and exploring the development of a Zika vaccine. To help address the outbreak, we partnered with IPADS, a Brazilian NGO, and the National Council of Municipal Health Secretaries to develop ZikaLab, the initiative that focuses on training the healthcare providers (HCPs) on Zika, including microcephaly transmission, prevention, diagnosis, treatment and follow-up. In 2017, we supported Phase 2 of the initiative, which equipped many high- and mid-level HCPs with updated Zika information so that they could offer enhanced healthcare services to patients. Further in 2017, we announced that Janssen entered the field of Zika vaccine development, in collaboration with the Beth Israel Deaconess Medical Center. Pre-clinical data and other indicators gave us confidence that a Janssen vaccine could differentiate from other candidates. A Phase 1 study, initiated at two clinical sites in the United States, is focused on the safety and immunogenicity of our vaccine candidate. In January 2017, Janssen and Johnson & Johnson Global Public Health formed a new collaboration with Medicines for Malaria Venture (MMV) to help develop better medicines to treat and protect vulnerable populations from malaria, including children and pregnant women. The partnership will focus on the development of new medicines suitable for reduced-dosing regimens, which help facilitate adherence to treatments and ensure they remain effective. One of the ways to do this is to formulate the medicine in such a way that it releases slowly into the body over time. By bringing to bear each organization’s expertise—Janssen in long-acting injectable formulation technology and MMV in malaria drug development—the partnership will combine knowledge and know-how to benefit people at risk of malaria. The combined team will begin investigations with P218 – a compound with the potential to provide protection against malaria, discovered through an MMV partnership with BIOTEC Thailand, Monash University and the London School of Hygiene and Tropical Medicine. 20 Janssen’s investigational Ebola vaccine regimen was developed in a collaborative research program with the National Institutes of Health (NIH) and received direct funding and preclinical services from the National Institute of Allergy and Infectious Diseases (NIAID), part of NIH, under Contract Numbers HHSN272200800056C, and HHSN272201000006I and HHSN272201200003I, respectively. The MVA-BN-Filo material used in Phase 1 studies was produced under NIAID/Fisher BioServices contract #FBS-004-009 and NIH contract HHSN272200800044C. BARDA previously awarded Janssen a total of US$44.6 million in 2015 and 2016 under contract HHSO100201500008C to help optimize manufacturing systems and capacity for the vaccine regimen, including heat-stability studies to verify that the regimen was optimized for use in African countries, and final product manufacturing and quality control activities. The U.S. Department of Defense (DoD) is also supporting the vaccine clinical program, with the United States Military HIV Research Program (MHRP) at the Walter Reed Army Institute of Research (WRAIR), with the Henry M. Jackson Foundation for the Advancement of Military Medicine (HJF) conducting one of the Phase 2 studies. The Innovative Medicines Initiative (IMI), which is supported by the European Commission, provided funding of more than €100M through the IMI Ebola+ Programme to support a number of consortia that are conducting multiple clinical trials and other vaccine development activities. Janssen’s partners in these consortia include the London School of Hygiene and Tropical Medicine, the Institut national de la santé et de la recherche médicale (Inserm), Inserm Transfert, University of Oxford, Le Centre Muraz, Bavarian Nordic A/S, Vibalogics, Grameen Foundation and World Vision of Ireland. The consortia funded by the Innovative Medicines Initiative 2 (IMI2) Joint Undertaking are EBOVAC1 (grant nr. 115854), EBOVAC2 (grant nr. 115861), EBOMAN (grant nr. 115850) and EBODAC (grant nr. 115847). This Joint Undertaking receives support from the EU’s Horizon 2020 research and innovation program and the European Federation of Pharmaceutical Industries and Associations (EFPIA).